Every Great Transition Starts with a Good Goodbye. October is not typically the season of new beginnings, but here at FIGT, it’s the time of year when we are excited by the new and exciting voices that are joining our community. Not only are we being inspired by the many wonderful RFPs and scholarship applications that have been submitted for the Conference, we are also welcoming our incoming Board members. We wanted to capture and share what inspired these hard working, dedicated and talented people to become involved with FIGT, and learn a little bit more about what they are most proud of. So here, in their own words, they share their own highlights. What are you happiest about or proudest of your time on the FIGT Board? Kristine: Having contributed to a challenging transition for FIGT moving its conference to Europe, establishing itself in Europe and now moving to Asia. Having been part of building the Board’s resilience during such a major change. The FIGT 20th Anniversary conference was a big accomplishment as well. It required a lot of work from the Board, committees and volunteers and became a true celebration of knowledge, friendship and togetherness. Daniela: It’s hard to pick one thing. I am proud of many things - the conferences, the program content, the diverse voices that we included. The most important thing for me was to keep building systems into our work so that as people change, this work can continue. And especially to build up a team that I am very proud of - that is important to my heart. 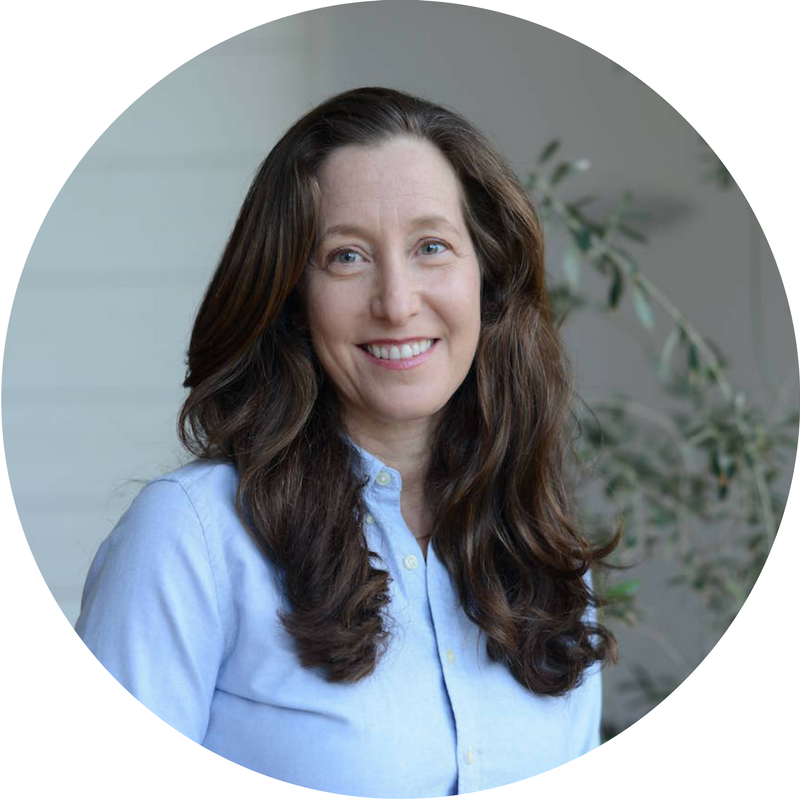 Amanda: I am happy that we’ve expanded the number of local Affiliates and given people further opportunities to stay connected to FIGT. I love the fact that we now have a FIGT presence both in Asia and South America. FIGT is an international organization and it should always be reflective of that diversity. Carolina: Happiest and proudest at the same time; the moment when we got the slate ready to be presented. I felt a sense of accomplishment and was SO happy to see such strong and amazing names together. Donnyale: I’m proudest about successfully promoting the 20th Anniversary with record participation in our social media activities, social crowdsourcing, RFP submissions and attendance. What did you enjoy most about being on the Board? Kristine: Getting to know so many talented and dedicated people, to effectively work with, manage and lead them, as well as learn from them. Being professionally challenged on so many levels and still be able to see the big picture in the ocean of changing elements and pieces. Daniela: I’m proud of being one of the non-native English speakers who brings another accent and background to an organization that was originally very American. I think it’s wonderful that we have this past and that we are welcoming people who are a bit different and I hope that it will continue to change and keep on growing. Amanda: The best part of the Board was certainly its members. There’s such a high level of dedication and commitment that is somewhat indescribable, especially when you consider these are not paid positions! Carolina: I have truly enjoyed the learning curve, a mixture of using my skills with doing something I have not done before. And above all, I had the pleasure of working with a group of different people walking towards the same goal. I was always inspired, sometimes challenged and often had a lot of fun! Donnyale: Creating and developing our team. Save one person, every Communications team member was new, and I was thrilled to work with them and develop new vision for the positions. Our team was engaged, excited and fun - the best part of my time on the Board! It’s always hard to say goodbye to people who have become such an integral part of our lives, work and our community, so we want to say a heartfelt ‘Thank You!’ to them all, and look forward to staying connected online and (hopefully!) in person at #FIGT19. Be a part of FIGT’s journey - volunteer for a committee! Head to https://www.figt.org/Get-Involved to find out more about the opportunities available. It's very encouraging, in our first year of moving the FIGT conference to Asia, to announce that we have received an outstanding number of proposals from potential presenters. As in recent years, many of these came in during the final week of the RFP period so were a welcome surprise. “We are thrilled to receive such a great number of proposals from presenters around the world. Our committee of readers are currently evaluating the proposals. Given the number of outstanding proposals, from new and familiar voices, it is a challenging task. We are looking forward to learning more about the agenda and the presenters in the coming months! #FIGTMembers in the News in August! Another month of exciting news of #FIGTMembers has come across our news feeds. David Hodson #FIGTMember and partner of the International Family Law Group, who are 2018 #FIGTSponsor, becomes one of the first fellows of the Asian Institute of Alternative Dispute Resolutions. Congratulations David! The AIDR will benefit from your knowledge and experience. It was also exciting to see notifications across social media that three of our #FIGTMembers including our founder Ruth Van Reken are joining together to present at the International Association for Counseling Conference in Rome. Ruth along with Shellee Burrows and Daniela Tomer will be leading a panel discussion about TCK and CCKs. This was a collaboration which developed at #FIGT18NL. You never know what might happen from attending an FIGT conference! Kate Berger showed up on LinkedIn being congratulated for an excellent video interview with the Financial Times speaking about the choices and challenges of international schools. It’s a beautiful video with great content. Also showing up on Linkedin with a picture of a newspaper article was Florence Chabert d'Hieres, #FIGTMember and volunteer in our Communications Team. The newspaper had written about her new book “I’m a citizen of the World” This book was also starring with many congratulations for Florence on the French speaking expatparents FB page. The book is available in both English and French and a great resource for parents, counselors and international schools. In the Summer 2018 edition of their magazine, Access, #FIGTMember and #FIGTSponsor for 2018 wrote about us! They congratulated FIGT on our 20 year celebration and called us a “Global Sister” organisation. Awww. We loved reading Julia Simons blog about the 19 Reasons to come to #FIGT2019 in Bangkok. My favourite is number 10 but it's hard to choose. Many of you will have completed Vivian Chiona’s survey on living an international life. Well the results are in! What do you think we miss the most? Read the interesting findings from Vivian's survey. Big Congratulations go to Elizabeth (Lisa) Liang whose amazing film, "Alien Citizen: An Earth Odyssey" won the Outstanding Achievement Award in the Performing Arts category at the Calcutta International Cult Film Festival! The showing of the movie was a hit at our last conference. If you get a chance to see it, don't miss it. Again this month there were some amazing #FIGTMembers writing about their current transitions. Our own Lillian Small (PPWR writer at #FIGT18NL and our Social Media Team Lead) writes about an unexpected move to Cairo and a few other exciting pieces of news! Marilyn Gardner is writing (beautifully as always) about leaving ‘home,' the journey, and the arrival in Ranya, Kurdistan. We wish her and Cliff all the best in this amazing new location. If you are an #FIGTMember and want to share your news for future editions please email us. The Counseling and Coaching Network. Counselors and coaches have become a growing subgroup in the FIGT community. As a result, the Program Team of #FIGT18NL decided for the first time to have an Early Birds session on Counseling and Coaching. The session was well attended and confirmed the need to have a platform to share ideas and information within this subgroup during the whole year cycle and not only during the yearly Conference. Communication, connection, and collaboration are at the heart of this initiative. We see it as an opportunity to create a platform of communication and to share information that is relevant to our niche in the field of global counseling. It can be the place to go when you are moving countries and you have to find your Counseling professional way again. A place where relevant professional education opportunities can be shared. A place for peer supervision and much more. We are looking forward to hearing from you. Please contact us at counseling@figt.org. Who are the David Pollock Scholars? Could you be one at #FIGT2019? Your voice is needed for our first ever Asia conference! The strong level of interest in their topics. From the experiences of non-privileged, forced expatriation of Hazara women living in liminality between Iran and Afghanistan; to families with special-needs children in Taiwan and beyond; to non-white, non-Western, non-Global North voices; to family abuse within the expat context; to Japanese-TCK experiences; to theater expressing TCK/CCK experiences; to the experiences of black migrants; to telling stories through art and puppetry for children to effectively manage relocation issues - the list is large over the years! The David C Pollock Scholarship honors a legend in the field of global mobility whose story became legend not through TV appearances, popular podcasts, internet postings or business schools touting successful global leadership skills, but through his work as a missionary in Africa, raising a family there, serving a greater purpose, and seeing the human impact of lives lived globally. He spoke, and wrote, passionately about the human impact on families and individuals in transition. He was able to make sense of the experiences and bring a voice to the voiceless, “to make the implicit explicit”, and always wondered who are we leaving out? Who is being left behind? And critically, he did something about it. 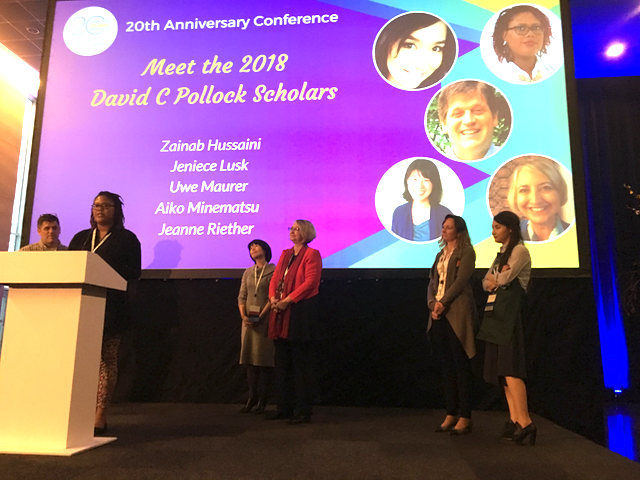 With the David C Pollock Scholarship funds raised every year at the conference, FIGT seeks to move his work forward and memorialize his mission by continuously asking not only “Who is missing” from the FIGT table? But also, how can their passion help others in global transition? What can be gained by lifting their voice and giving opportunity to attend? contacts, networks, ideas, resources, and friendships garnered at FIGT Conference. Next year’s conference will be held for the very first time in Asia, in Bangkok, from April 26th -28th 2019. Applications for the David Pollock Scholarship (and the Request for Proposals to present) are now open and close on September 30th. For more information and to begin the Application Process click here. FIGT is fortunate to have supportive sponsors. This is the fifth of a short series of articles highlighting those whose invaluable financial and professional support helps keep FIGT growing. A first-time FIGT sponsor in 2018 is RelocateGuru, owned by Nicole Blyth. Her company grew out of a personal observation about an obvious need she encountered in her own life after moving home 16 times: how to feel like a local in a new place, right from the start, without having to research hundreds of websites. For Nicole, it was experiencing her first FIGT conference in 2017 that brought both a sense of community and a desire to support that community through sponsorship. Attending the 2018 conference as a sponsor, Nicole gained valuable feedback on the RelocateGuru app directly from the very people who can contribute to it, help spread the word about it, and benefit from using it. “In particular, the conference highlighted the importance of expat spouses being an essential support to overseas assignments that don't often get the recognition they deserve. I hope that RelocateGuru would be a useful resource that supports these unsung heroes, helping to make the practical and emotional challenges of transition to somewhere new easier. It was great to get feedback on what everyone wished the app could do and this is having a direct impact on how it is being developed. The collective knowledge we all have from so many places from around the world, this community has always been my ideal first members of the app. The feedback from everyone has been incredibly useful to help make RelocateGuru the community and resource you will want to download and use whether you are moving or just want to help others feel welcome and be the resource you want to tell everyone about! 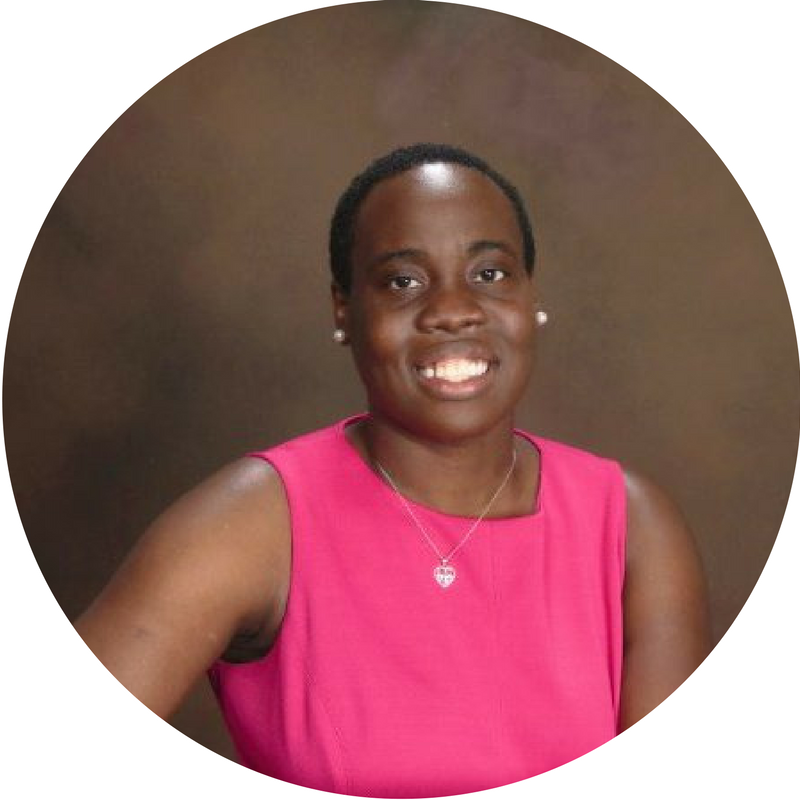 Nicole also believes the RelocateGuru app will help benefit those offering coaching, training, counseling, relocation and other needed services for the globally mobile community. As a sponsor, Nicole and RelocateGuru help ensure that we better support people living, working and studying across cultures throughout the year. Sponsorship is also vital to help fund our annual conferences, and keeping conference registration fees lower than practically any other three-day event in the world. For the past five years, the Parfitt Pascoe Writing Residency has been a vital part of the Families in Global Transition Conference. The opportunity for budding writers to receive formal training, mentoring, writing assignments and publishing opportunities has been eagerly embraced by the FIGT and expat writing communities. So, it is with real sadness that FIGT is announcing that PPWR will not be a part of #FIGT2019. Jo Parfitt, the driving force behind the PPWR, is currently unable to continue in her driving role of managing the Residency. Those of you who follow Jo’s Monday Morning Musings will be aware of some of the personal challenges Jo is facing and her need to prioritise balance and self-care. All of us, on the FIGT Board, appreciate and understand Jo’s decision. We will review the writing residency concept in the future. For now, we wish Jo strength and blessings. There have been 22 writing residents, 100s of articles and 100s of thousands of words. We thank Jo (and her partner in PPWR, Robin Pascoe) for the legacy of writers and writings they have created. We’ve noticed several FIGT members popping up in our newsfeeds over the past few months so we started taking notes to share and celebrate with you all. Don’t worry -there were no scandals - it was all good news! Featuring significantly was Katia Vlachos. Her recently published book, ‘A Great Move: Surviving and Thriving in Your Expat Assignment’ hit the headlines in different places. From the Financial Times business books of the month in June to Relocate Global Magazine LIDPublishing and the expatnetwork Katia’s work was admired and appreciated. Congratulations Katia! Katarina Holm-Didio, one of FIGT’s NY Tri-State Affiliate leaders and a former board member, recently wrote an article for BR Anchor Publishing about having a baby while living abroad and she referenced us –and another #FIGTmember, Lisa Ferland. Thanks Kat. Child Psychologist and Expat Relocation Consultant, Kate Berger, was interviewed as a recognised expert in an article for the Dutch News about Dutch repatriates. It is well worth reading. 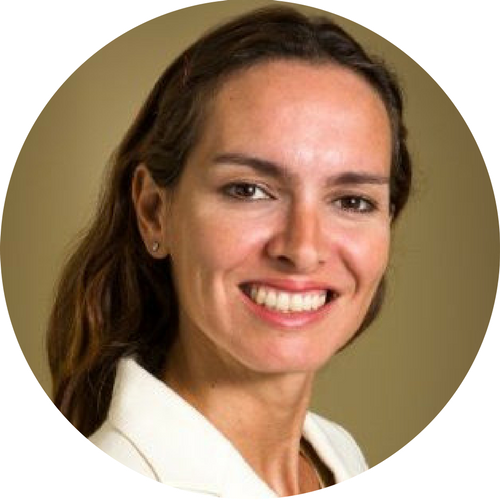 British based FIGT member, Louise Wiles, ran a comprehensive Global Mobility Virtual Summit featuring presentations from several FIGT experts. Dania Santana, Multiculturalism, Diversity, and Inclusion Expert was excited to learn her proposal had made it to the community voting for the 2019 South by Southwest Film Festival for her Panel Idea: The Hispanic Marketing Sauce: Are we all Mexican? Over 5,700 proposal were received so getting through to the voting stage is a big achievement! You can support her by voting up on the Panel Picker site. Naomi Hattaway, has launched an inspiring new initiative –the I am a Triangle Impact Initiative. If you heard her speak at our conference earlier this year in The Hague you will know of her desire to make an impact in the world and her belief that those of us who have global experiences are in a unique position to do so. The first project she has chosen to focus on is one led by another of our amazing members Marilyn Gardner, educating nurses in Kurdistan – you can support this great opportunity and have an impact on a different part of the world. Speaking of different parts of the world, our Facebook feed has been busy with posts by FIGT members in transition, telling their stories of their latest global moves with beautiful writing that takes us on the journey with them. We wish you safe journeys and smooth landings Maryam Afnan Ahmad, Lucille Abendanon and Mariam Ottimofiore and look forward to more details in blogs yet written. 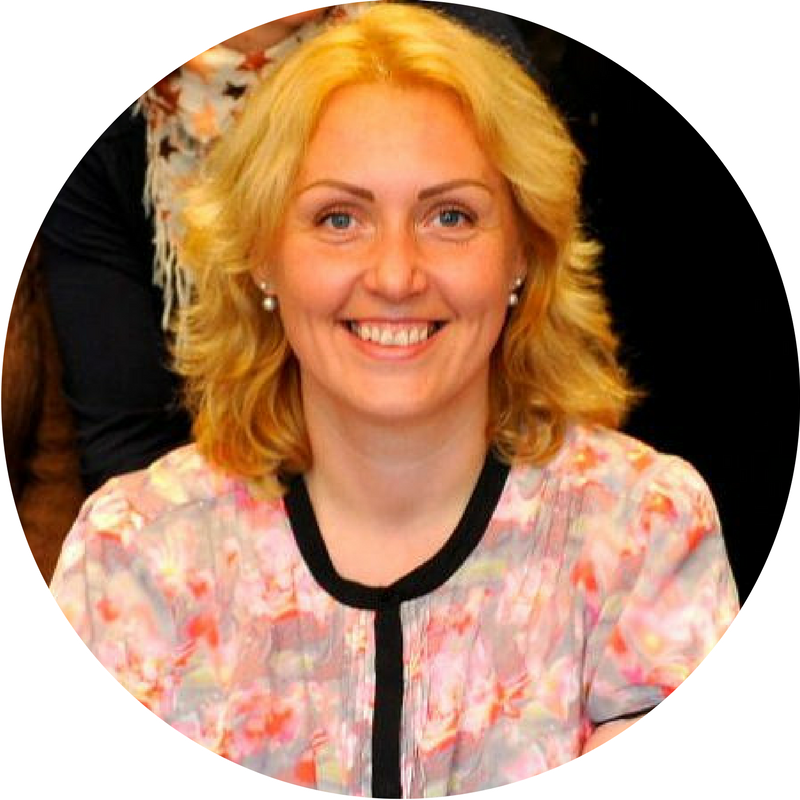 And Tanya Crossman may have won the award for publishing the first #FIGTMember blog about our next conference! She tells us who should go to #FIGT2019 in Bangkok and why! A new monthly message from our Membership Chair: for members & non-members alike. An opportunity to remind the community of the treasure of resources, solutions and opportunities this broader community has to offer. 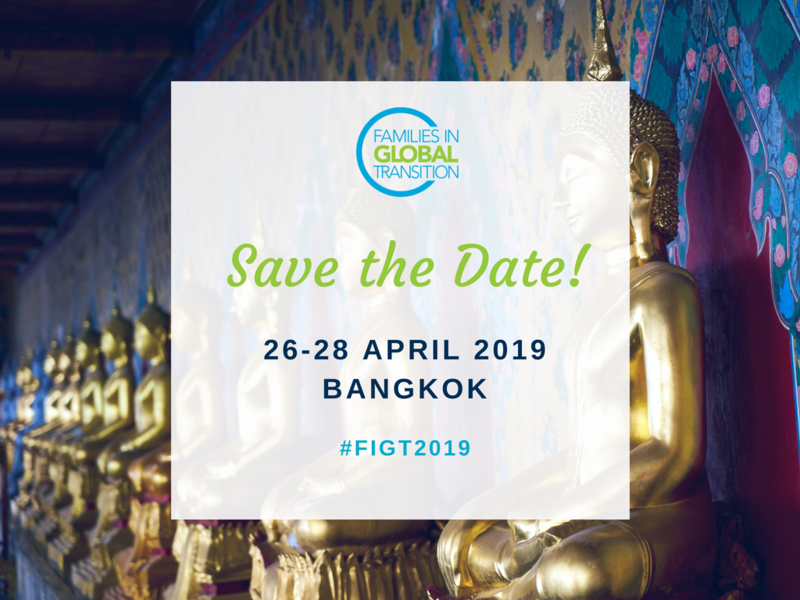 Before I share this months’ #FIGTmember moment ….how excited are you about the announcement made regarding #FIGT2019? I for one, am already looking forward to the excitement of a new location, the new discussions which will no doubt result and of course, hoping as many of those I have connected with in the past - at conferences or online - will be there too. As exciting and important as our annual conference is, we know, as Board members that not everyone can attend. This was in part one of the reasons a new membership strategy was launched in The Hague at #FIGT18. We wanted to extend the dynamics of the connections made between people drawn to FIGT year round - to those who are able to attend a conference, as well as those who are not able. We reduced our annual membership to make FIGT more accessible; we introduced the Public Directory for organisations, international schools, small businesses and non-profits to be available as resources to all (member as well as non-member) and we have opened a group on Facebook for our members who are on Facebook. To date our groups on FB have either been conference or theme related - but we want to invite all to the discussion - regardless of whether or not they have attended a conference. 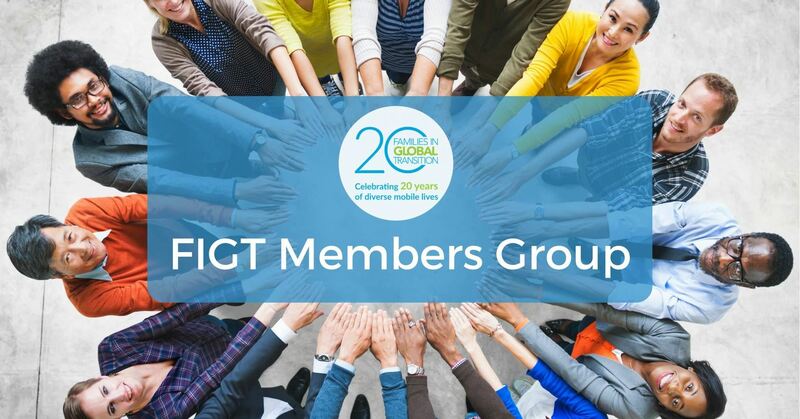 So, if you are a member but have not yet asked to join the FIGT Members Facebook group, please do so. All our members are welcome to join and share who they are, what they are doing, call for help for resources as they move, arrive to of leave from a location. We appreciate not everyone is on Facebook, so to those who are not, please take advantage of the Members Only section of our website, where you can also reach out to fellow members with a question, suggestion or conversation. And, less active - but with intentions to grow - we are also on LinkedIn - as a page and a group. Rest assured, as is our practice, a Conference Group will be opened for 2019 Conference attendees as soon as conference registration opens. Are you listed in the Public Directory? DO take a moment to ensure your profile is updated and complete. You can do so by logging in. Having difficulty? Get in touch with Judy, our Administrator who would be happy to help uploading your profile picture or logo. 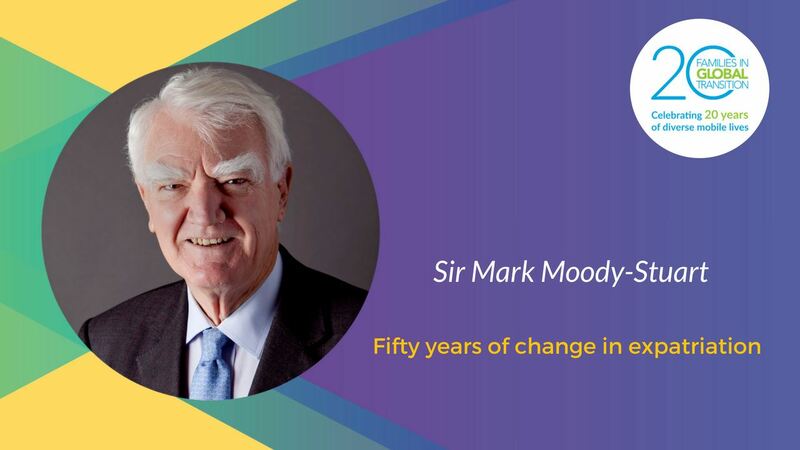 Take a look & listen: Sir Mark Moody-Stuarts’ Keynote presentation at #FIGT18 is now available. This keynote presentation resulted in much discussion, and debate - about corporates being at the FIGT ‘table’: should they?, why?, what could they bring to the discussion or take from the experience? Sir Mark’s Keynote address is now available to all our Members. Lastly, interested in becoming an FIGT Member? We did announce a new, more accessible fee structure and categories at #FIGT18 which you can read about here.